Before you can answer that question, you have to first answer a number of other questions and define what kind of building it is. Is the building a tower or communications antennae or does it serve some other purpose? Where do you start measuring the building? Do you include the basement, underground supports or, in some cases, the underwater portions of the structure? Additionally, if an antennae is added to the top of the structure, do you include it to be part of the measurement? 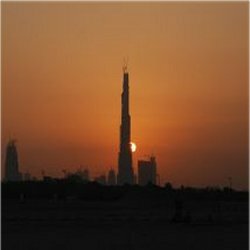 As of February 2010, the world’s tallest structure is the Burj Khalifa in Dubai. It is 828m (2 720 feet) tall. The structure officially opened on Jan. 4th 2010. This structure is presently holding the record in both the tower and skyscraper categories. Until its opening, the record for the world’s tallest tower was held by the KVLY-TV Mast which is in North Dakota. It stands at 628.8m ( 2 063 feet). The CN tower in Toronto Canada still holds the world’s record for being the tallest concrete tower at 553.3 m (1 815 feet). This entry was posted in Fun Trivia, Locations Trivia and tagged skyscraper trivia, tallest building trivia, tower trivia by Jane. Bookmark the permalink.